Studio 3DO was the in-house talent making games to showcase its namesake console. They would make eight of these titles, all with an appropriately multimedia slant, before the 3DO dream died (for a few reasons, but mostly the absurd $699 price of the console). Most third party developers then chose to port their titles to the PlayStation and/or Saturn, but Studio 3DO’s projects almost all went down with the ship. 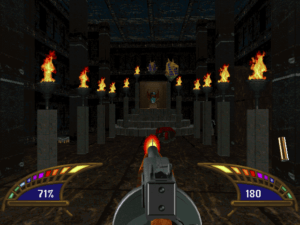 The one exception is this title – completely redeveloped for the PC market by Logicware, and it’s this version of the spooky shooter that we’ll be talking about today. The island is littered with secret temples and shrines. 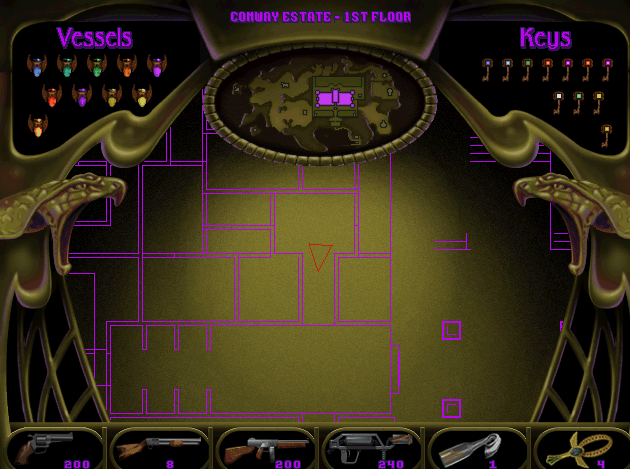 The plot sends you to an isolated island dominated by the mansion of 1930s heiress and socialite, Tess Conway. Tess is way into Egyptology, and by exploiting her wealth and six of her friends, has acquired an ancient artifact she believes will grant her eternal life. After placing her essence into ten vessels and hiding them around the island (something something Osiris – just go with it), she appears to have completed the necessary ritual. And it works… sort of. You play as a lone investigator landing on the island, and find the grounds overflowing with undead and supernatural beasties. What went wrong? Where is everybody? Can you undo the curse and escape? As a 3DO showcase, the game’s major selling point was the integrated Full Motion Video you’d encounter throughout the island. At marked points around the map, ghostly videos would seamlessly play within the world, showing you the soap opera drama leading up to the night of the doomed ritual. Beyond that, it was a fairly clunky shooter. Gameplay videos will show a game with choppy framerates, awkward gunplay, and an odd affinity for shooting rowdy ducks. In a flooded market, it hardly looked worth a PC player’s time. Studio 3DO presumably recognized this, so the PC re-release is a very different game. The console engine is gone, replaced by one with smoother framerates and vast draw distances – performing most similarly to Realms of the Haunting. The game’s semi open-world aspects have been enhanced here, resulting in an island you can wander and backtrack through without noticeable load times, and mostly without restriction. 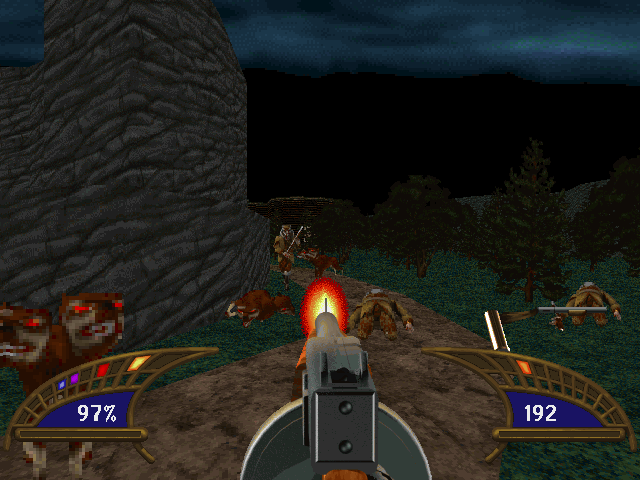 Enemies are redesigned (nary a duck will you now find), and contemporary PC controls make aiming far less of a chore than it was with a digital pad. If you take one thing away from this review, it should be this – the PC version is not the somewhat janky console shooter you might have seen in previews or videos. Spoopy ghosteses act out the story. The premise hasn’t changed, and the in-world FMV still acts as the star of the show. 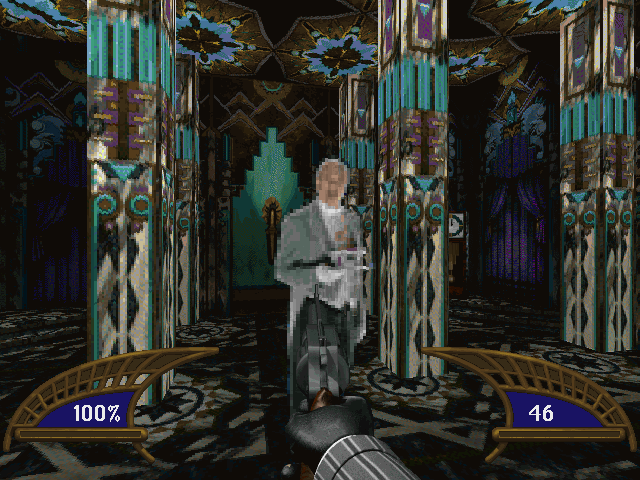 A ghostly haze present on the console isn’t replicated here – instead it’s blocky shots of greenscreened actors with a slight transparency added. That’s a disappointment, but it’s still a neat trick to see the video load and play while you can still move freely around the area. Be careful about stopping to watch, though, as enemies you haven’t cleared can and will sneak up on you while you’re distracted. The incessant cries of “Help me!” that accompany a video marker can also start to grate, especially since a video location never goes away, even after you’ve watched the whole thing. While this is a first person shooter, you’ll definitely want to come with an interest in exploration over pure action. Ten door keys and ten of Tess’ vessels are scattered around the island, and once you find all twenty, the game isn’t even over yet (I won’t spoil anything, except to say you’ll have yet more running and searching to do). If wandering mazes, backtracking, and reexamining areas cause you’re somewhat lost doesn’t sound appealing to you, this probably isn’t a game you’ll be into. That exploration is smartly designed, though. Enemies you kill stay dead, so traveling across the island late-game becomes quick and straightforward. A brown dirt path leads to all the major locations on the island – it’s not much of a spoiler to say that’s where the vessels are – so following them to test some newly-acquired keys makes getting around a simple task. An automap exists, and while its range is frustratingly limited, it’s good enough to navigate the caves and mazes thrown at you. Keys and vessels are color-coded, so you can reference a walkthrough for the missing ones if you need to, but you’ll still want to make sure you’re keeping track of unsearched locations on your own. The enemies don’t usually match the Egyptian theme, but come off a bit less goofy in the PC version. When it becomes killing time, the game is reasonably up to the task. You have six period weapons at your disposal, and they fill traditional FPS roles. The shotgun does best at close range, and is your “go-to” choice. 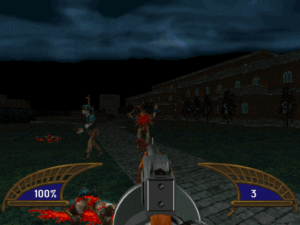 The tommy gun chews through ammo, but chews through enemies just as quickly. Molotov cocktails cut through tight groups in the rare occasions you’re able to toss them to exploit this. The flamethrower is your power weapon, with an apparently-infinite range and the damage to drop most baddies in one hit, but you’ll never have as much ammo for it as you’d want. 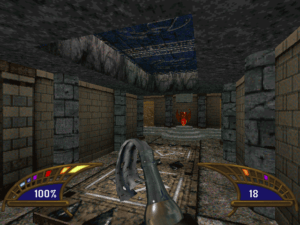 A final seventh weapon is an Egyptian staff that wipes out all nearby enemies BFG-style, but a limit of 5 shots means you’ll want to save it for special occasions. Ammo is liberally spread across the island (an early throwaway video scene explains why), but your personal capacity is quite limited. This doesn’t quite tread into survival horror territory, but I definitely found myself out of precious ammo and running worrying low on what’s left. You can go from fully stocked to “uh-oh” pretty quickly – especially in some of the mazes that cut you off from the rest of the island – and plenty of times I’d come out of lengthy encounters with nothing but a few pistol rounds and a bandoleer of harsh language. “Restock trips” around the island became a very necessary thing for me. While dedicated ammo management never needed to cross my mind, you’ll still want to be a little smart about where and how often you pull the trigger. 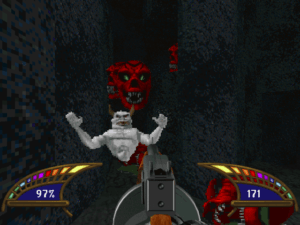 Enemies are all taken from the console release, with no apparent changes to their behavior. While they were based on digital photos on the console, most here use computer renders as their source, which to me is a look that doesn’t age well. Two-headed dogs and pinstriped mobsters look exceedingly plastic and artificial, and while the clowns (yeah, clowns) no longer stretch their fingers to “tickle” you to death, their stiff computer animation makes them seem like refugees from the wrong game. Draw distances extend nearly to the horizon in the PC version. Controls are also a little rough. You are able to remap keys to your liking, and its easy enough to change the defaults to a modern WASD setup. However, settings like mouse sensitivity and the ability to turn off the mouse’s forward movement aren’t available, so whipping yourself around unintentionally happens often. Likewise, you are unable to strafe and turn at the same time, which led me to receiving a lot of damage I felt I shouldn’t have, as well as making general navigation annoying. You have a jump, which is flat useless (like Ultima Underworld, you drop like a stone immediately). 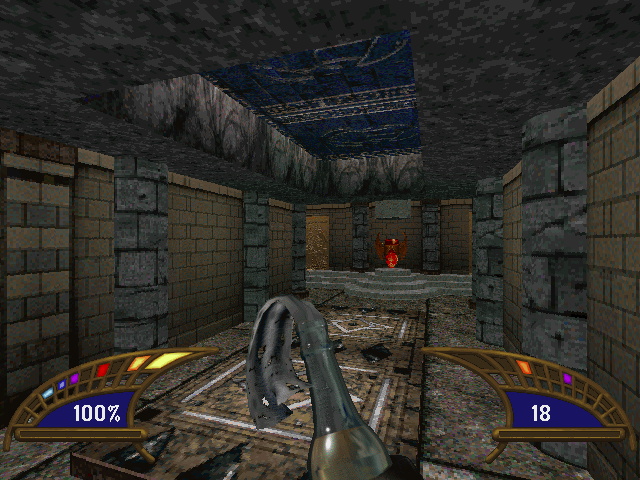 The engine also lets you get “caught” on walls, slowing your movement to crawl if you’re brushing up against them. It’s bad in exploration, and worse in a firefight. It’s not that gunplay is bad here, it’s just never much beyond serviceable. 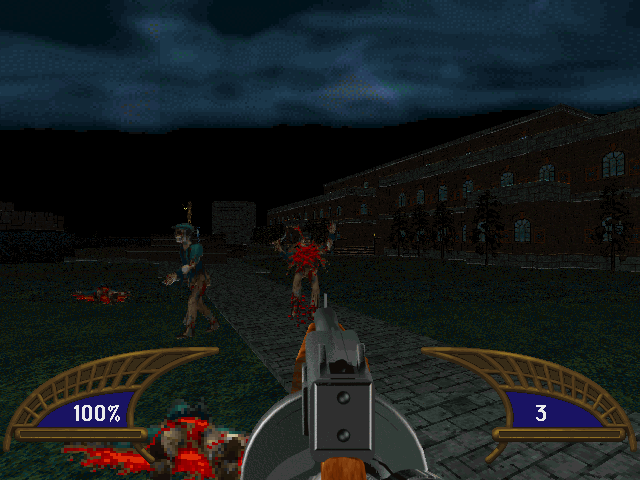 With the exception of the zombie gardeners (who bleed profusely when shot), there’s not a clear indication that you’re even hitting these rendered models, much less locked in savage combat. There’s smart decisions here – a couple of surprise monster closets can trap you, large groups to fight at once are frequent, and I love that health primarily comes from blue orbs dropped by the defeated (encouraging you to get in there and mix it up) – but fighting never feels that satisfying. It’s a combination of awkward movement and limited feedback, and you’re expecting raw 90s action, you’ll be disappointed. One additional point of interest is in the music. As with the console release, the background music changes based on your location, instead of switching at a level change. It’s not as smooth a transition as something like LucasArts’ iMuse, and it seems more like musical “zones” were defined that click to a new track when you enter them. Still, you’ll go from creepy atmosphere tracks to raucous jazz in what seem like thematically appropriate areas, and without a loading screen. Each of Tess’ vessels give you a one-shot superpower. They’re not actually that great. I used two for the whole game. It took me about 10 hours from start to end credits, though I did read ahead in the walkthrough and spoiled a bit of what might have eaten up some time in futile bumbling around. It was a good time for most of it. It’s an absolute blessing that creatures don’t respawn, especially with as much backtracking as I did. The “meh” combat would have made this a miserable slog if I had to repeat the island’s largest groups. The video and the plot it feeds you is schlocky in a suitable B-movie way, and though I didn’t feel like every character got a resolution, you won’t question what became of the major ones. I should note that lots of video repeats – perhaps the PC release expands significantly enough on the 3DO’s map size that they felt the need to reuse clips as padding. I again come back to Realms of the Haunting as the game most similar to this one, and the best indicator of whether you’ll enjoy it. This is less a first person shooter than it is an exploration game with guns, and you’ll need a healthy dose of curiosity to keep you moving past the game’s more irritating aspects. The FMV inclusions are cheesy, the shooting is average, but the exploration, level design, and artwork are all worth seeing. Overall, it’s not a bad way to… waste hours. There’s a reasonable mystery here to keep you progressing. Locations look the part. Challenging, but not unfair. Big update over the original 3DO release. Controls are better than on the 3DO, but still not up to modern standards. Guns have little weight behind their shots. Backtracking is required as you find new keys and traverse the mostly open island. Great to see you back, J Man. And at Halloween time, too, which is fitting given this site’s tradition of updates at this point of the year. An interesting read as always – genuinely had never heard of this one before, either on 3DO or PC. Thanks! Glad to be back! This took much more dedicated time than I remember reviews taking, but I hope to keep it up. I’ll never be as prolific as I used to be, but I enjoyed doing this. As for the game, I remember it from games magazines that showed off screenshots and “Wow! FMV right inside your game!” hype in a most 90s way. Acclaim was set to port it over to the Playstation but cancelled for some reason. I’m not gonna lie, seeing a new J Man review on the frontpage reminded me of how I felt in high school seeing a new JGR review show up on the mainpage. I was excited to read through this, even though I’d never heard of the game before. Damn fine work, Chief.